With the increasing need for clean drinking water and irrigation storage for farming use, CROMAFLOW offers our solution to meet the customer’s needs. 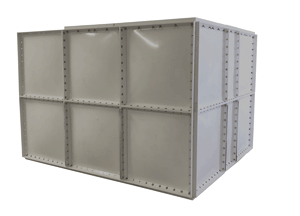 Expandable Panels – Pre-engineered and bolted together onsite to specific requirements are expandable without requiring the purchase of additional tankage. Quality – Water storage solutions using food grade approved sectional panels are assembled onsite in modular and flexible patterns that produce long term reliability. Shipping Ease – Conventional water storage tanks are bulky to ship. CROMAFLOW units are shipped on pallets to save space and to make handling easy.